IF you think Labrador is all about old buildings, think again. One of the Gold Coast’s oldest suburbs is about to undergo a major facelift as developers eye off new towers and families move in. Labrador is shrugging off a tired and shabby reputation, according to civic leaders who say the suburb is on the cusp of a major revamp. Gleaming towers and new houses are planned for the Broadwater community as new figures show the suburb, directly north of Southport, is already seeing signs of a revamp. Labrador has benefited from development of a $16.5 million hockey complex for the Commonwealth Games. Labrador is a boom area. And figures show the suburb has become one of the fastest-growing areas of the city, with 621 units sold there in the 12 months to June this year. The figure, only topped by Southport and Surfers Paradise, came on the back of house values growing 39 per cent in the past five years, while unit values jumped nearly 21 per cent. Real estate industry veterans say younger families are moving to the area, attracted by the lower cost of housing and improved schools. Ryan Canilho, of Knobel and Davis, said perceptions of Labrador were changing as the area became a family friendly waterside location. He said local schools had seen a big influx in students as families moved in. Council figures show more than 48 development applications were made in the area in the past year, slightly up on the previous year’s figures. Among the newest was a 13-storey, 108-unit residential tower in Marine Parade, a 21-storey development — Isola Apartments in Central Street — that would cater to short-term holiday rentals, and a 23-level building planned for Frank Street. UDIA state president Stephen Harrison said Labrador had historically been undervalued and its properties had not appreciated as much as nearby areas. “It’s partly playing catch-up with the nearby growth,” he said. “Labrador’s central location and easy access to roads, and social and community infrastructure means people want to live there but they want the right type of product, preferably new. City planning boss Councillor Cameron Caldwell said the area was already showing the signs of the changing times, with “funky’’ restaurants moving into Chirn Park and ongoing construction activity. 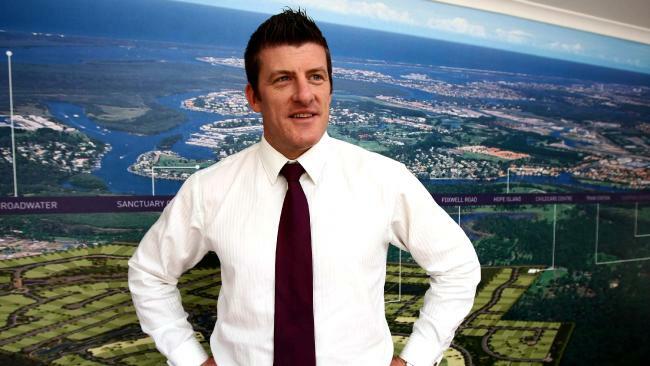 “Labrador is increasingly being seen as ideally located next to the Broadwater and just one suburb away from the central business district of Southport,” he said. “Areas such as Chirn Park are already seeing this transformation, with funky and contemporary cafes. The next major change began last month with the closure of the area’s KFC, a fast-food landmark for nearly 50 years. Developer Sunland will turn the site, on the corner of Frank Street and Marine Parade, into a $136 million, 35-storey tower called One Marine Parade. KFC has relocated the popular eatery, which opened in 1969, to an Ashmore site in Olsen Ave.
Work will not start immediately on the new tower. Sunland managing director Sahba Abedian said a launch date had not been decided. “Sunland acquired the KFC site in 2013 with the intention of one day transforming it into an elegant high-rise residential tower with a ground-floor cafe and dining amenities,” Mr Abedian said.